The author addresses the junior officer attrition problem by identifying and discussing the disparity between senior and junior officers in terms of generational differences. Officers from the Baby Boom Generation think and perceive things differently than officers from Generation X. 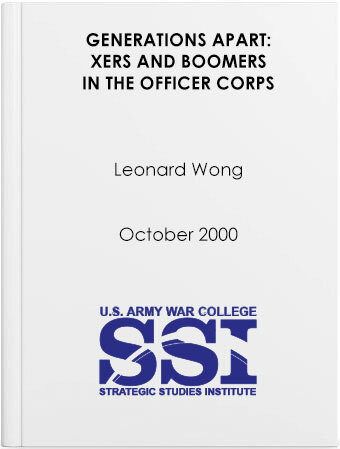 Using empirical evidence to support the generational differences literature, the author points out that Generation X officers are more confident in their abilities, perceive loyalty differently, want more balance between work and family, and are not intimidated by rank. Additionally, while pay is important to Generation X officers, it alone will not keep junior officers from leaving. The solutions presented in the monograph range from strategic policies changing the Army as an organization to operational leadership actions affecting the face-to-face interaction between senior and junior officers.